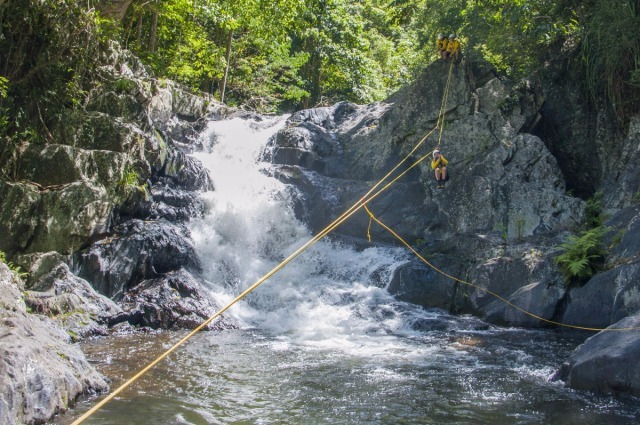 Bring out your inner dare devil Canyoning in the rainforest where you abseil, Zip Line, Slide & Jump beside waterfalls and into pools. 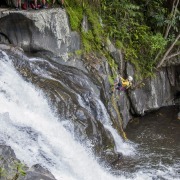 Crystal Canyon is in a secluded section of Crystal Cascades where the excitement of Canyoning a rocky watercourse can be enjoyed in a safe and controlled environment under the supervision of experienced guides. 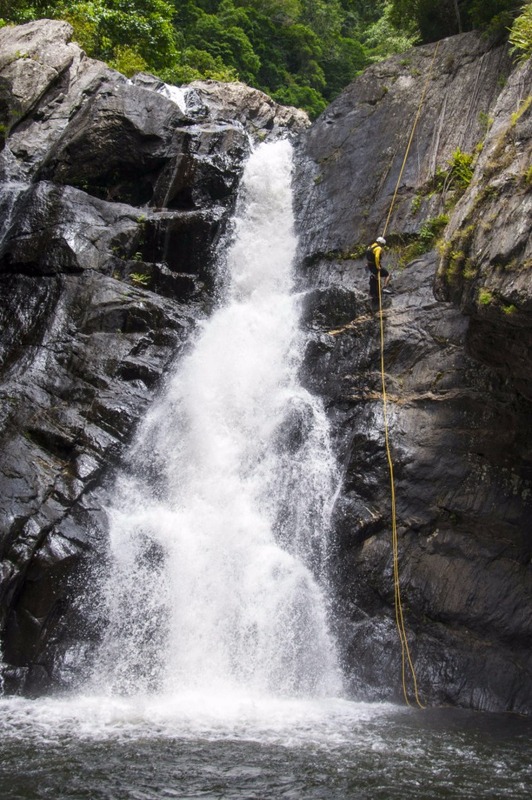 Canyoning designed for beginners: This half day adventure is suitable for most fitness levels, including those who cannot swim. Beginners and those who have tried Canyoning before are welcome. Participants are challenged to push their own boundaries with the assistance of specialist guides to support and help conquer your fears. The Adventure starts at the viewing platform at Devil’s Drop, Crystal Cascades where you leave the public access areas, for the higher reaches of the tropical watercourse. This is fed via a series of controlled spillways by Copperlode Dam. After a detailed safety talk and short walk up the track, your first abseil for the day is an 11m controlled descent down the granite rock beside your first waterfall in the spillway section. Cool off at the bottom in the slippery dip slide that will lead you to where your next challenge awaits...the biggest drop of the day, a 30m abseil down Big Cheese! The course continues with a total of 8 rappels, 3 Jumps, 2 slides and a very cool Zip Line! Along the way you will also have the use of hand lines to ensure you are extra safe while having fun. 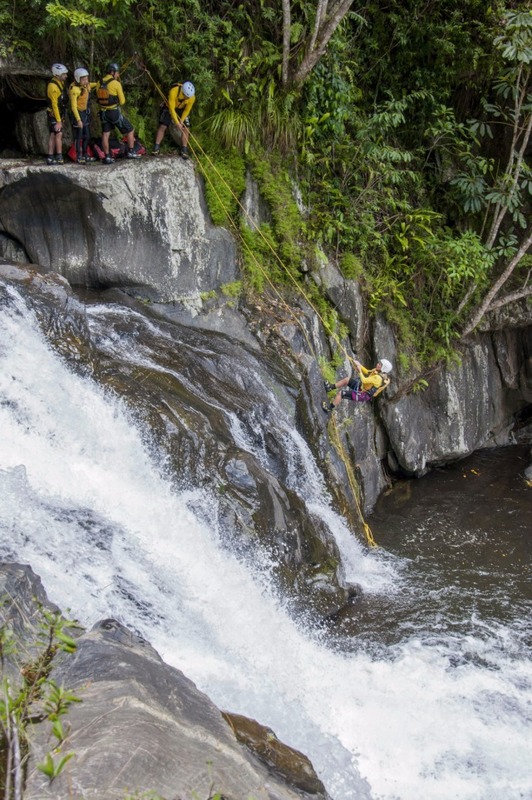 This Canyoning adventure will push you outside of your comfort zone as your tackle the challenge of conquering massive boulders and white water in the pristine beauty of a secluded rainforest watercourse. Wildlife including monitor lizards, snakes, birds and a array of colourful butterflies and dragonflies can be seen. Padded activity shorts to wear under board shorts, helmet, socks, Canyoning boots, carabiners, harness, light lunch and cold water. Protective safety gear including Canyoning harness, helmet, shoes, longsleeve thermal top for sun protection, neoprene shorts and a low-profile life jacket all padded to provide extra protection from the rocks. 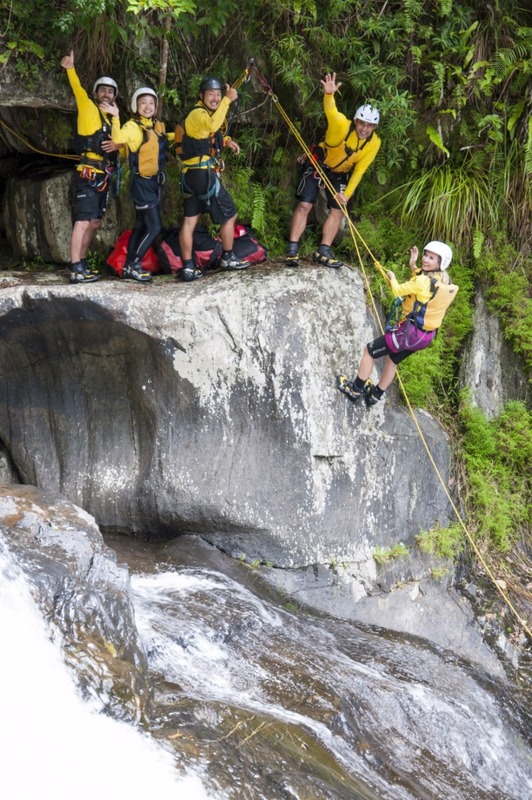 Designed for beginners and those who have tried Canyoning before. Most fitness levels however you do need some fitness. It is also challenging. Those who cannot swim can still participate. 6:30am Pick-up from your accommodation (Time provided when booking). and a very cool zip line with water landing! 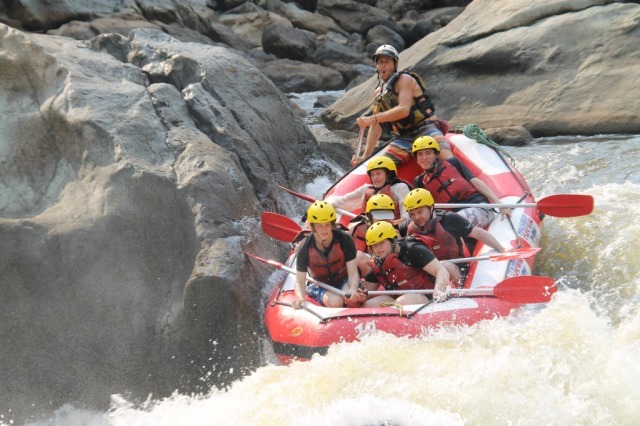 In the afternoon, white water rafting with Raging Thunder is on the Barron River and includes approximately 2 hours on the river. 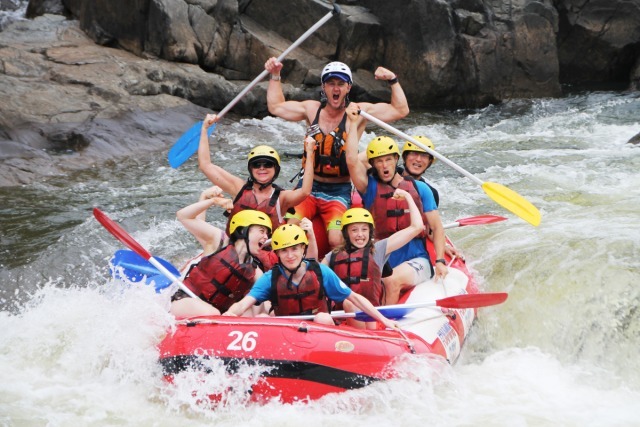 Barron River Rafting is perfect for anyone who has never tried White Water Rafting or those looking for an afternoon of fun. 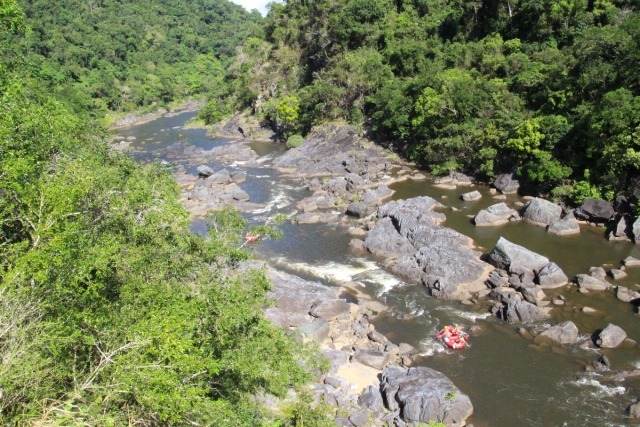 Your guide will take you on an eco-adventure through the Barron Gorge National Park aboard your 8 person inflatable raft, tackling grade 2 and 3 rapids including the infamous Rooster Tail, where an action photo will be taken. Plus you’ll get a chance to try raft surfing (dependent on water levels) and to cool off with a swim in Lake Placid. The rescue 3 trained guides will give you all the tuition needed for this exciting afternoon rafting! 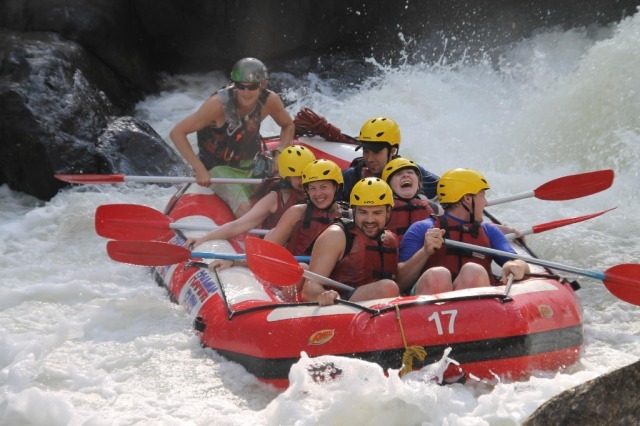 No experience is necessary, in fact most people who book this tour have never been rafting before. 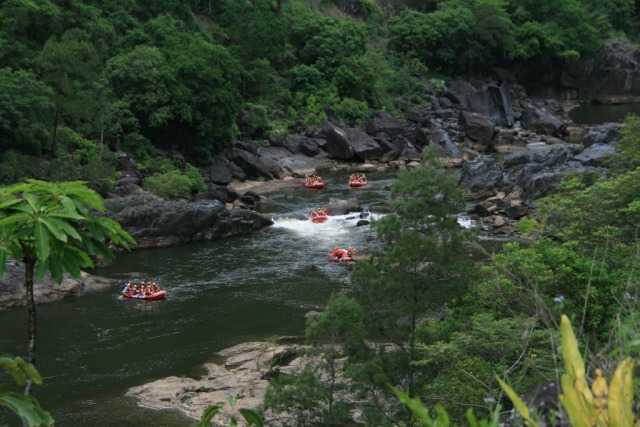 Your guide will give you comprehensive safety instructions and the world's best Rafts are used. Departures: Monday, Tuesday, Thursday and Friday. For a self-drive, meet the group at the Lake Placid Car Park at 2:30pm. Optional Extras: Photos and merchandise are available for purchase. Money for souvenirs and snacks, photos etc. Please do not wear any jewellery - it is recommended that you leave anything of value in your hotel safe for this trip. The minimum age for rafting the Barron River is 13 years. 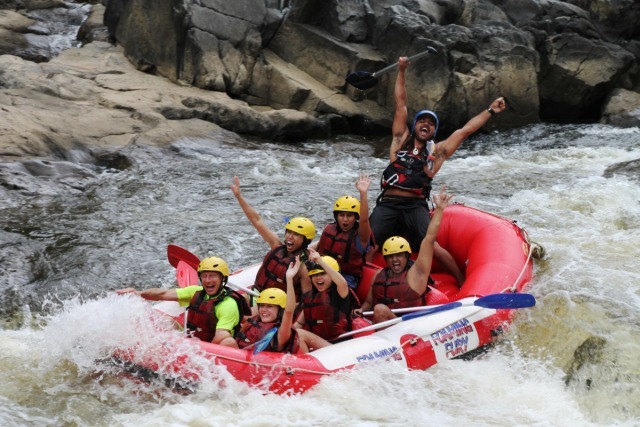 Rafting is not suitable for anyone who is pregnant. GREAT NEWS! All bookings made through Travstar do not incur a credit card surcharge.